© 2001 The Estate of Sam Francis/Artists Rights Society (ARS), New York. Photograph by R.H. Hensleigh.. Though Sam Francis is best known for his vibrant spatterings of color, an equally important part of his painterly vocabulary is the blank white space that he left around his corpuscular islands of fiery hues. Located near the center or at the edges of the canvas, the artist preferred to see this blank area not as a void or vacuum but as a Zen-like region that, though physically empty, was limitless and charged with energy. Francis began reading Carl Jung in the early 1970s, and was influenced by the Swiss psychologist’s idea that the nature of the universe is dynamic and ever-changing, in an ongoing creative process. “To constantly live in chaos,” Francis wrote, “is to live within perfection.” His working method was accordingly fluid and somewhat chaotic. 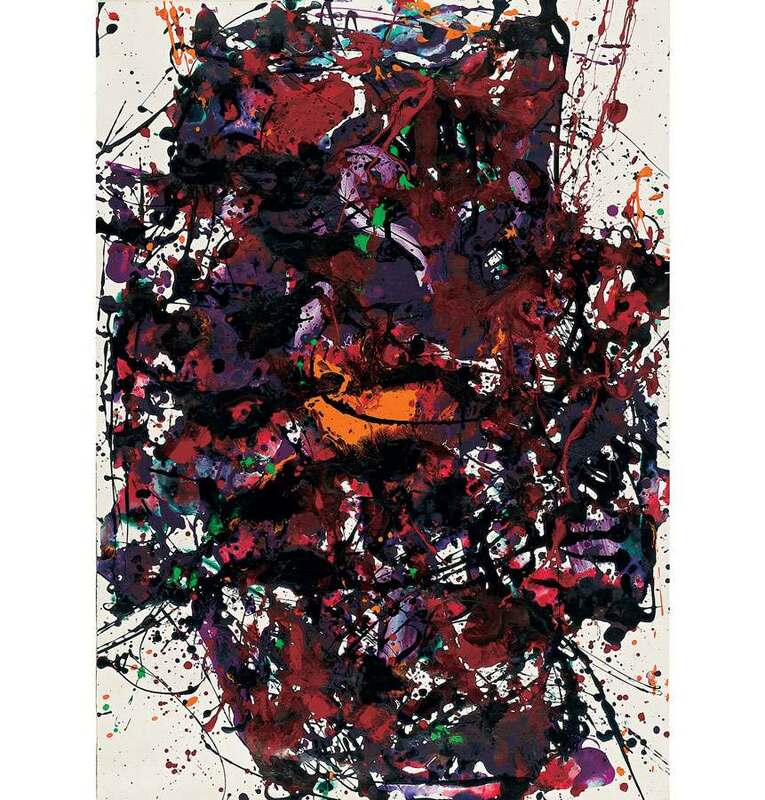 He painted “automatically”—flinging and spilling paint onto large canvases without conscious planning or premeditation—melding the spontaneous technique of Abstract Expressionist painters such as Jackson Pollock with the richly saturated lyrical colors of 1960s open-form Color Field Painters such as Morris Louis and Jules Olitski. Francis began making art in San Francisco’s Veteran’s Administration Hospital while recuperating from spinal injuries suffered as a fighter pilot during World War II. Lying flat on his back and nearly immobile in a body cast, he was struck by the play of light, color and shadow across his ceiling and in the sky over the Pacific Ocean. Enrolling at the University of California at Berkeley, Francis received his M.F.A. in 1950 before moving to Paris, where he would spend the next twelve years. Deeply affected by the work he saw in museums there, especially by the use of color in Monet and Matisse, Francis commented that he wanted to retain the lush colors of Monet’s Waterlilies series while abandoning representational subject matter. The artist worked first in monochrome and then began to paint abstract, cell-like patterns of bright primary colors, often organized in a rough grid or other geometric pattern. In this smaller work from 1985, Francis covers the paper surface with the jewel- like colors of the Byzantine mosaics that he loved. Patches of ruby red, deep violet, iridescent orange and lime green are juxtaposed with areas of inky black, and thick patches of color interlaced with tiny drips and thin skeins of flung paint. Affected by Jung’s writings on alchemy, Francis conceptualized painting as a process that involved a transformation of the ancient elements of earth, air, water and fire. Believing color to be the “real force in nature and in the psyche,” he declared “red and gold, blue and purple, and green” to be the “five basic colors,” with red and gold signifying burning light, blue and purple standing for the ocean and sky, and green representing foliage and organic forms. Despite the dense mottled mass at the center of Untitled, bits of luminous white appear through the color and in the work’s four corners, lending the painting a sense of the airy, seemingly weightless openness for which Francis has become known.